Patra's Other Place: So this is retirement?? Well, it's Ken's idea of fun - not mine! He had a new t.v. cabinet delivered and assembled here on Tuesday, and it took him all Wednesday to untangle all the wires and plugs, and put the various home theatre components into the cabinet (laser disc player, DVD player, Blu Ray play, amplifier, tape deck, Foxtel black box...). 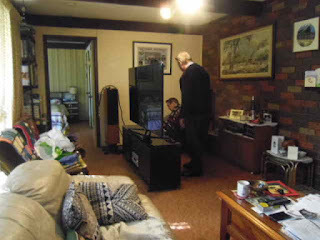 Today his mate Mark came over and they unpacked the t.v. from the box. 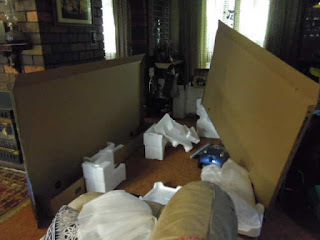 I was greatly relieved to see it wasn't as big as the box it came in! There is far too much cardboard and packing stuff to put into the household garbage bins, so I'm going to have to get a skip delivered to get rid of it all....another expense. What are the guys looking at down there? This...OMG. I daresay most people these days have this kind of mess behind their computers and t.v. sets. 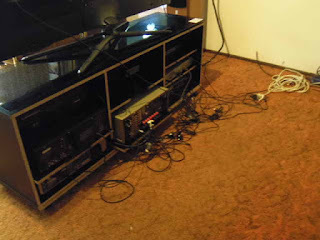 If I was on my own, there would be none of it, simply because I wouldn't know the first thing about connecting any of the bits to each other! Mark turning it on and setting up the visuals while Ken looks on helplessly. Mark has worked in the retail industry with computers and t.vs for years, so he is very clever with all this. 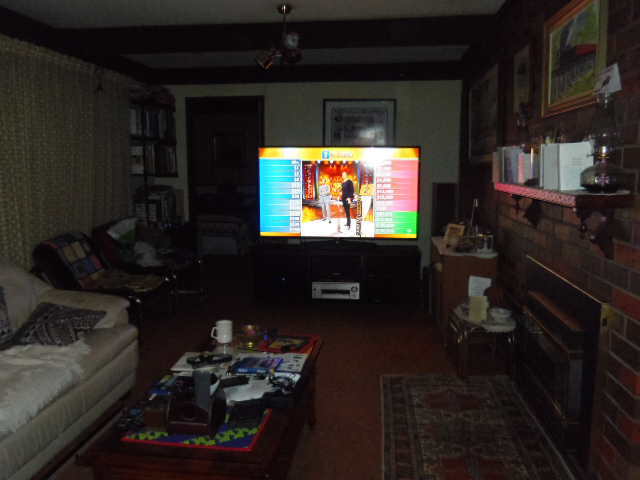 Well this is what our lounge room will look like from now on. 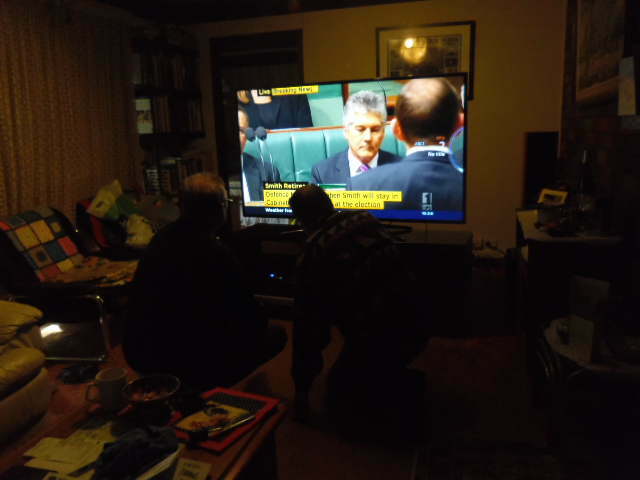 Fractionally better when the t.v. is pushed up closer to the back wall. Anyone for popcorn? Funny, Gina! I feel your pain. 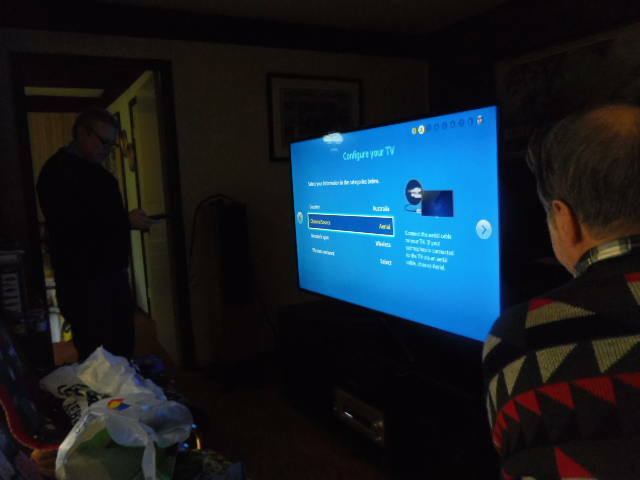 What is it with men and big T.V. 's?